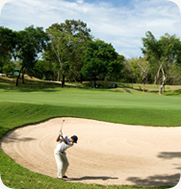 The nearest and the newest Championship 18-hole golf course to Icandi Hideaway is Banyan Golf Club, which is a 30 minutes drive from Icandi. 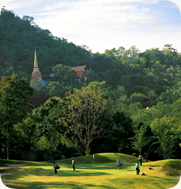 Designed and constructed by Thailand's leading golf course architect Pirapon Namatra. Banyan Golf Club is a World-Class Championship golf and dining facility that has been designed to be enjoyed by players at all levels and visitors. The club has a unique contemporay Thai style designed clubhouse featuring luxurious changing rooms, exclusive club suite accommodation and wonderful dining experiences. Spectacular sunset views will make it a memorable experience for everyone to enjoy. Banyan Gold Club as well as Palm Hills Golf Course,Black Mountain Golf Course, Imperial Lake View and Springfield Royal Country Club & Golf Course are all 30-90 minutes away from Icandi Hideaway. Situated in total privacy this makes it the perfect villa for the golfer looking to relax after a day at the golf course. The house manager can arrange transport to any of these wonderful courses.